The Naturals Lube Cube contains an assortment of Sliquid's best lubes, including water-based, silicone and hybrid formulas to enhance your pleasure. All lubes are 100% vegan, glycerine-free and female-friendly for total peace of mind. Order over the phone: Call 1-437-887-1456 and quote code 71617. The 12 x 5ml sachets are ideal for travel or as little tasters before you invest in a bottle. With 2 of each variety included, you're truly spoilt for choice! I knew I wanted a Sliquid lube, because these guys are just one of the best lube makers out there, but couldn't decide which. This pack came in very handy, so I could test out multiple lubes before investing in one that I know I'll love. Also great for travelling, these sachets open up in a really small point that ensures you don't accidentally waste any, but still flows out when you squeeze. Definitely worth it! A variety of types. Doesn't spill. High-quality lubes. The water-based ones don't last very long. 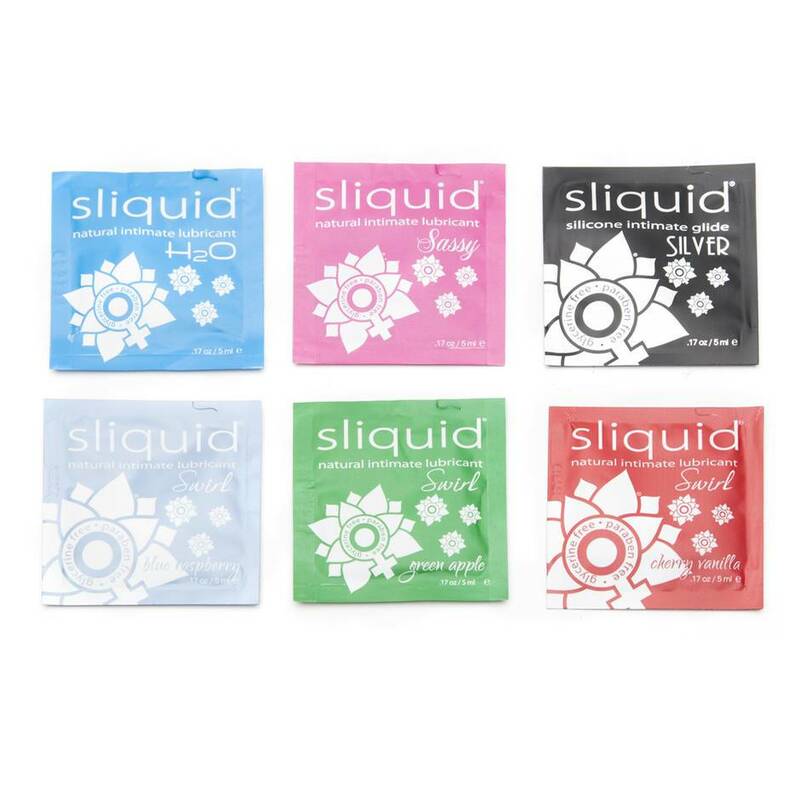 Amazing variety of lubes in convenient sachets. What a fantastic little pack. Husband and I don't usually need to use lubes, but we thought we'd give these a try for something different. The pack is nice and small and discreet so could easily be taken away. The variety pack is a nice way to try different varieties before purchasing the small size. The blue raspberry is so far my favourite. It's a subtle hint of flavour, rather than full in and sickly sweet. I added a small amount to the husband before sucking it off. It certainly had the desired effect! The tiniest amount went the longest way. One sachet would easily last 2-3 sessions. Well worth the money. These little lube sachets are really handy. They are great if you're travelling, I like to take them when going on holiday as a 200ml bottle isn't always suitable. 5ml doesn't sound like much but I've found it's more than enough. The price is reasonable and it's an interesting selection you get. Nice size, fit in your pocket or wallet. GF not a fan of all flavours, some go unused.